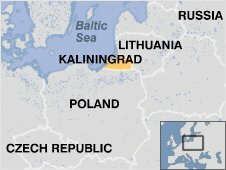 Russia's military has announced it will halt its plans to deploy short-range missiles in its Baltic enclave Kaliningrad, Interfax news agency says. A Russian military official said a change in US attitude had prompted the latest decision, Interfax reports. The US envoy to Nato, Kurt Volker, said that if true, the suspension would be a "very positive step", the Reuters news agency reported. Russia had said the US missile shield plan in Europe was a direct threat. 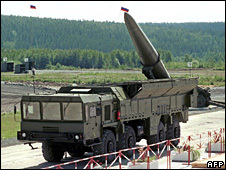 In November last year, Mr Medvedev announced that short-range Iskander missiles would be deployed in Kaliningrad, bordering Poland, to neutralise the perceived US threat. The US has insisted that its plan to base radars and interceptor missiles in Poland and the Czech Republic is designed solely to guard against attack by "rogue states", such as Iran. While the Russian defence ministry has not confirmed the latest Interfax report, the BBC's James Rodgers in Moscow says the agency is often used by the Kremlin to float proposals. Interfax quoted an unnamed military official as saying that "the implementation of these plans has been halted in connection with the fact that the new US administration is not rushing through plans to deploy" parts of its missile defence shield in eastern Europe. If the official's statement is borne out it may signal a wider hope in the Kremlin that the US under President Barack Obama will roll back the plans for the missile defence shield, our correspondent says. Before he took office on 20 January, Mr Obama's transition team said he had not made a commitment to deploying the missile defence system in eastern Europe and would wait to see if the technology proved workable. If Russia does shelve its Iskander deployment, it would be a substantial conciliatory measure to the new US administration, our correspondent adds. President Obama spoke to President Medvedev by telephone on Monday. The two men pledged to stop the "drift" in their countries' relations, the White House said. Any decision not to deploy the Iskanders could also provide impetus to wider strategic arms talks between Russia and the US, says BBC world affairs correspondent Paul Reynolds. The 1991 Start I treaty, which provides a mechanism to monitor the two countries' nuclear arsenals, is up for renewal in December. The US has agreements in place with Poland and the Czech Republic to plug what the US has said is a gap in its global system of missile defence. The proposed system has Nato-wide backing. The US has said Iran is working on long-range missile technology and that the US missile shield would counter this. The US plan infuriated Moscow and soured relations with the US.